I received my tutor’s feedback on Assignment 4 – Mono and collatype printing a couple of weeks ago. In the past I have shared my reflection but not the actual tutor report on this blog. In response to a recent question my tutor advised “I am totally happy with my tutor feedback forms being made public. I believe this will help other students and shows this is an open dialogue between tutors and students.” Although Rebecca’s reports have overall been very positive this feels like another step up in the vulnerability stakes. A major theme in this course has been dealing with, accepting, embracing, risk. So here is a link to download a pdf: Tutor’s feedback. Links to earlier feedback forms are included under the relevant Assignment on my Mixed Media for Textiles contents page here. I’m very pleased that Rebecca has recognised both my difficulties in the early stages of the assignment and that I was able to challenge and change my mindset. The result was “a good range of work”, but I agree that the more important outcome is learning how to learn, how to reflect on and respond to difficulties, to recognise and take advantage of opportunities. I like the suggestion of working a form around the page to see the effect on the total composition. Given composition is one of my major goals in the current assignment I need to make sure to try this. Although I have been writing about exploring space and three dimensions, photographs on this blog remain my major communication tool and I need to make them as dynamic and interesting as possible. Bringing past samples into current work is always pleasing. As associations and connections build it gives extra depth and strength to the work. It’s also a great way to consolidate learning. I certainly mean to continue this in the current assignment. A number of times in her reports Rebecca has encouraged me to take risks and go with even the crazy-seeming ideas. I’ve just starting sampling for my final pieces and realise I’m virtually daring myself. If I think an idea’s too out there I must try it. For future reference the current example involves crystal organza and plastic horsehair inspired by an enameled copper work by June Schwartz. It’s not looking promising, but just maybe I’ll discover something amazing from it. The focus I’ve chosen for the assignment should allow me to keep experimenting and pushing right to the end – my main concern at this point is simply time. As soon as I read the suggestion to make pencil drawings to examine detail of some of my prints I couldn’t believe I’d missed the idea. We’re learning that feedback loop, looking at and building on what we’ve done to take us further, looking at details for something unexpected or new. I couldn’t find a way to translate the prints further, but simple lines of selected areas… of course! In the last couple of weeks I’ve been focused on developing ideas for the final piece, but I’m now at a point where I should be able to try this. I’m currently in the research stage of assignment 5 and can see that although I’m searching widely I probably haven’t focused in enough, really picked apart what I’m seeing. As Rebecca noted I learnt a lot from the Degas detail exercise. I’ve got a couple of ideas to try over this Research stage to push myself on this. One suggestion puzzles me. “I suggest you continue to develop ‘how’ you think about your work, learning from this deliberation and feeding it back into your creative process.” I recently read The First Book I Wish I’d Had At Art College by lb Vindbjerg (available free on amazon – here, a link given by another student on the OCA forum). It discusses eight perspectives for approaching art, which I suppose might be useful in thinking about my own work. Or could it be that I have concentrated on materials and techniques, with only cursory asides on potential content? Any suggestions would be most welcome. I’ve listened to some TED talks on where ideas come from and made a few notes in my sketchbook. Feeling somewhat flooded by ideas during the Review stage I haven’t made deliberate practical use yet, but I’m sure the time will come. I originally penciled in 14 March for the final assignment due date and this is the date suggested by Rebecca. However given assignment 4 was delayed a couple of weeks over the Christmas / New Year break I’m currently aiming at 28 March. If I keep focused and work steadily I should do it. In my review of assignment 3 (12-Oct-2015) I noted the different rhythm of work. Assignment 2 was a buzz of one sample leading quickly to another as ideas kept generating. Assignment 3 had technical constraints, took time to set up, time to see results – but from the beginning I had interesting materials producing more success than failure. Printmaking in assignment 4 was different again. There were technical skills to learn, but early results were not exciting. The project exercises felt compartmentalised, the majority of prints were dull. At the end of the Sorting post (2-Jan-2015) I’ve written about dealing with those challenges because I want to take forward and develop the skills gained. By exercise 4 of project 1 the balance changed. There was setup time – masks, stencils, later collatype plates – but once done the flowing, immediate, one attempt leading to another buzz began. The early exercises had provided the basic skills to be able to respond to and develop what I saw happening. As described above my focus was on using printmaking as a tool rather than traditional, formal printmaking technical skills. There are smudges, there aren’t always borders, I used extremely bulky materials on a collage block (computer components and plaster chunks). Over the final project I developed processes and technical skills that I believe will prove of great value to me in my ongoing creative work. Using combinations of a gelatin plate and collage blocks I could build complex textures and shapes that allowed me to explore my subject material in different ways, as shown in the banded ironstone formation collage block prints shown above. This blog continues to be the core of my presentation of all my course work. A contents page provides an easy way to navigate to different sections of work (link, also reached via the menu bar). Images of all prints produced are on a pinterest board (link) and a second board holds research images (link). I have been considering presentation of work for assessment. To date my tutor has accepted entirely digital submissions. Postage from and to Australia is expensive, slow and has limitations on dimensions as well as weight. Many samples are too fragile, too heavy or too large to post. Many samples were recorded then dismantled. Most items can’t be mounted for presentation in any sensible way. I don’t want to send an unbalanced selection based on what is easy to post rather than what is of interest, and I don’t want to send a box of jumbled bits and pieces. I need to discuss this with my tutor, but my current thought is either entirely digital, or a very small ruthlessly edited number of samples with associated documentation to supplement this blog. As discussed in my Research wrapup post (1-Jan-2016) I found it difficult to embed my research in my sampling work. My sketchbook work also faltered during this assignment. My Pinnacles collatype collage block was based on sketches before and during my visit there, augmented by a few drawings developing the design for printing (23-Dec-2015). 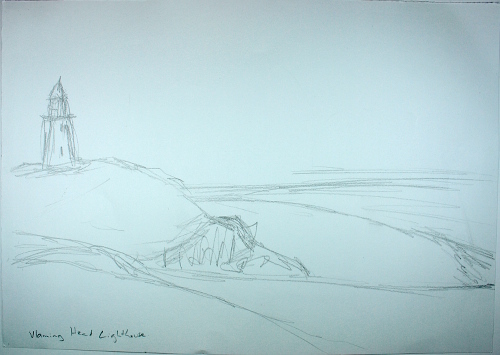 However I wasn’t able to make sketching part of my research or in recording my own prints. I found it too difficult to draw from a print as part of developing my own prints. On reflection this makes no sense. 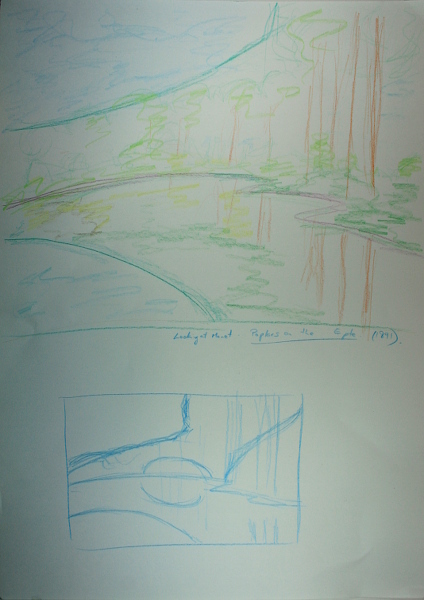 I made a sketch based on a painting by Monet when developing a design for a series of experiments (3-Nov-2015). Somehow there was an extra level of translation which gave me space to work. Perhaps a more honest answer is that the printmaking itself was two dimensional drawing and markmaking and I resisted doing still more. Over the period of this course I have been exposed to a range of printmaking techniques. 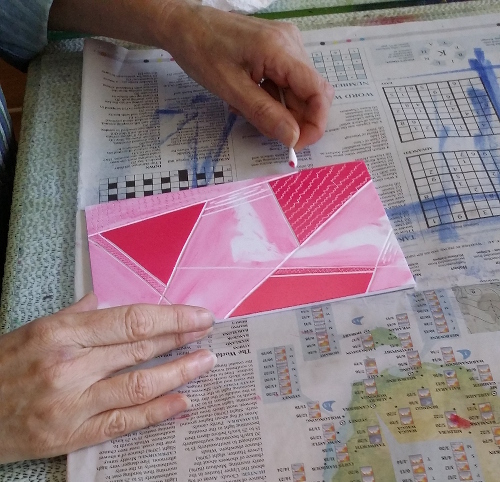 There was an Experimental Collagraphs workshop with Jet James, using pvc foam board as the print matrix (16-Jul-2015); Breakdown screen printing with Lin Wilson (17-Oct-2015); and a day of lino and foamex with Claire Brach (31-Dec-2015). In this assignment I have focused on some key materials, the akua intaglio inks and liquid pigment with cartridge paper. However I have ventured beyond this. A partial listing is given in an appendix below. I feel confident that printmaking will be an integral part of my creative process in the future. Finally, I have returned to the feedback from my tutor for assignment 3. My initial response to that, heavily influenced by the work I was doing when I received it, was posted 8-Nov-2015. 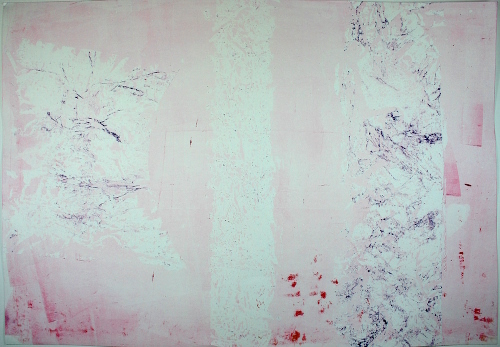 I consider I have continued to build on some of the areas identified by Rebecca – returning to and integrating previous parts of the course; although I touched on a range of materials and techniques I have also focused on a core set; I was challenged by the early failures but analysed the situation and found a mindset to support progress; I’ve continued to take sidetracks which I believe have been justified by results. My main causes for concern are varied, relevant research and development of my drawing skills. I will need to prioritise those areas in the weeks to come. Following this process of review I feel refocused and excited by the challenges of assignment 5. Paper (most dry, some damp): cartridge , newsprint, arches 88, stonehenge, copy paper, rice paper (plain and pattern-cut), sheet music. Hand pressure, baren, brayer, small craft press (relief and intaglio), burnishing with wooden clay shaping tools, metal spoons, etc. Brushes, fabrics, plastic card (cut as required), tile adhesive spreaders, corrugated cardboard, chopsticks, skewers, sticks, wooden clay shapers, fingers, paper towel, cotton buds, homemade tools from found objects, insect screen, roller, release agent, water, polystyrene, craft foam, materials from previous parts of the course including computer components, plaster chunks, heat distorted plastic and felt, etc. It’s mostly pleasant and somewhat cathartic to reach this stage of the assignment process. I’ve gone back through all my posts, looked at all my prints, and seen the journey from stumbling first steps to innovation and a level of confidence. An overview of all the prints can seen on pinterest – www.pinterest.com/fibresofbeing/mixed-media-for-textiles-assignment-4/. In Sorting I have identified a number for comment. 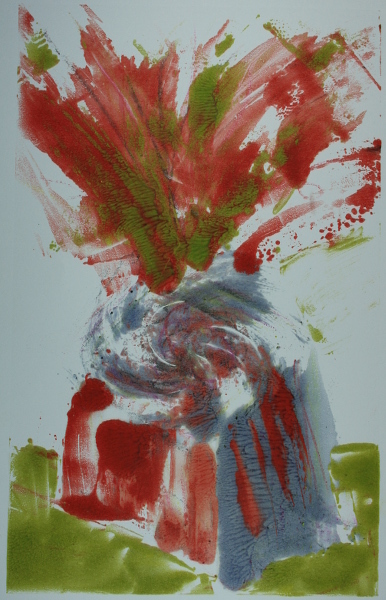 Print p4-8 (18-Oct-2015) was an early sign of hope in the challenging first days of this assignment and combines a number of ideas to take forward – uneven colour mixing, energetic lines, repetition of simple elements – lines and swirls. It doesn’t have to be complex to be effective. I was unhappy with print p4-17 at the time (25-Oct-2015) although it has some interesting marks. I’ve included it in Sorting because it was an attempt to copy directly marks seen in Giovanni Benedetto Castiglione’s Creation of Adam. I tend to take little bits of information from my research, but this print is a reminder of the learning value in direct copying. Print p4-22 (25-Oct-2015) includes lifting colour and texturing with crumpled foil, overlaying colour and creating a line with ink-covered string. I like the dynamic line and the way it extends just over the borders of the plate. 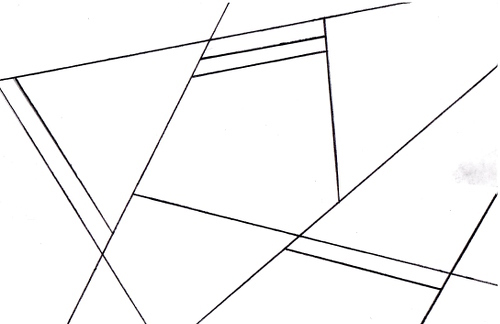 The string would be a fast, interesting way to “draw” when recording samples in the future – a different way to see shapes. 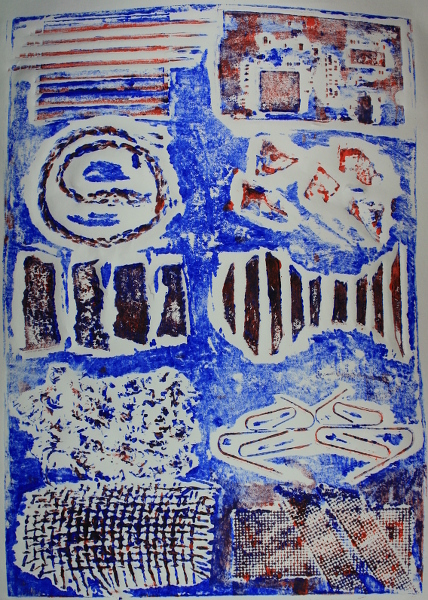 Print p4-29 (27-Oct-2015) used a lot of stamping and layering as well as marks drawn into the plate. Craft foam can be easily cut to shape and makes a good stamp. Breaking out of the boundary of the plate can be effective. What I most like about this print is the complexity of overlaid textured colour. Print p4-32 (27-Oct-2015) was my first attempt to break into three dimensions. It used paper crumpling and shaping learnt in Part 1. The texture created by printing then partially opening the crumples is attractive, but it’s the shaping possibilities that really interest. The move into three dimensions continued with print p4-34 (27-Oct-2015), which used paper folding to create a three colour print. When displayed partly folded the print shows different colours and patterning depending on the angle of viewing. Print p4-37 (3-Nov-2015) is included here not for any particular ideas to take forward but because despite flaws I see it as my first satisfying image. There is depth but it isn’t overly realistic. The colours are limited but effective. 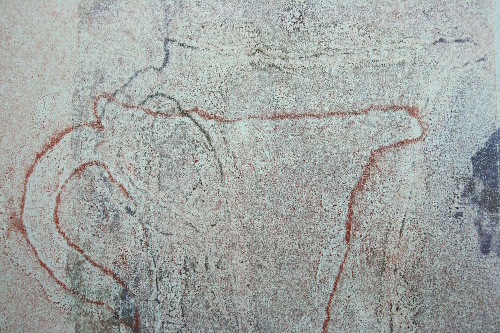 A range of mark making techniques were used, and they combine well to create a variety of textures. This is one of three variations of the same design, based on a painting by Monet. The other versions used water soluble crayons and oil pastels and were not successful. Prints p4-45 and p4-46 (11-Nov-2015) both record a sample from earlier in the course, p2-76. In fact they respond to a sketch based on that sample. 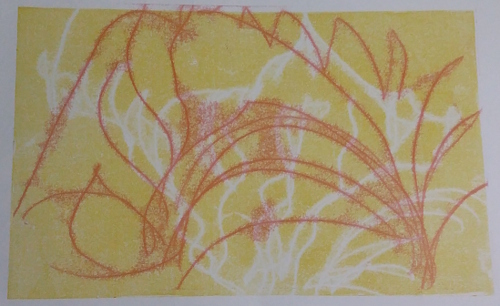 I have chosen them for their exuberance, as an example of using printmaking as part of the creation process, and because of the problem-solving shown working towards the energetic lines I wanted. Print p4-60 and its companion p4-61 used layer of backdrawing and ghost printing to examine one of my favourite samples, p3-33. The print evolved from a number of ideas, explained in the original post (14-Nov-2015). As an image it’s a bit of a mess, but it’s a great success in terms of seeing the sample and developing material that could be taken further. 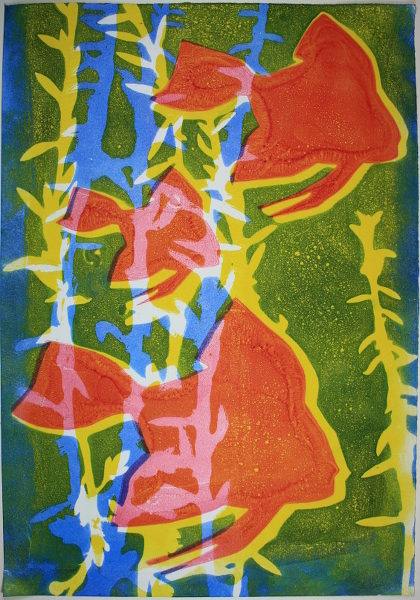 Print p4-70 is one of a series of prints using stencils in project 1 exercise 4 (22-Nov-2015). 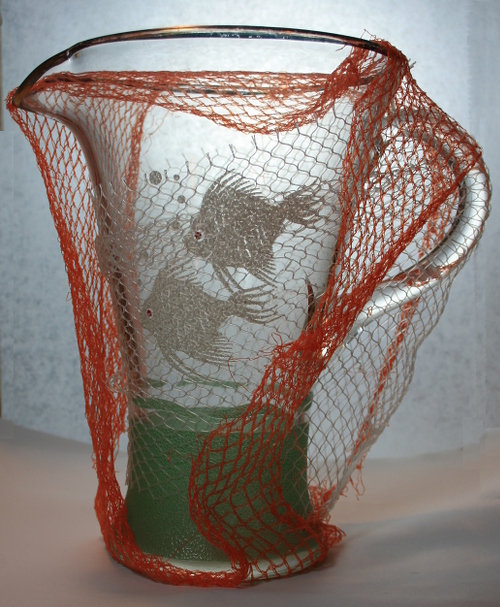 The image is based on a jug used earlier in wrapping exercises. 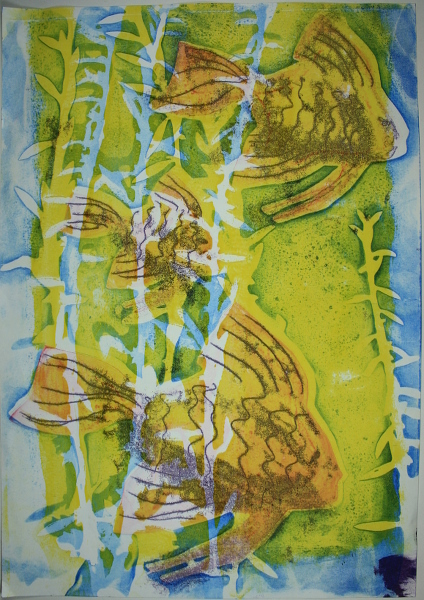 This print shows interesting colour work, mark making using a tool I devised and decent registration. At the time I was encouraged by this as showing my progress. I like the graphic qualities with just the smallest suggestion of depth. 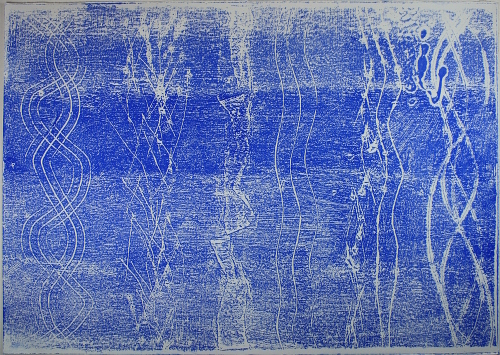 The wave lines respond to the water theme of the jug itself. I see this as a good response to the brief. 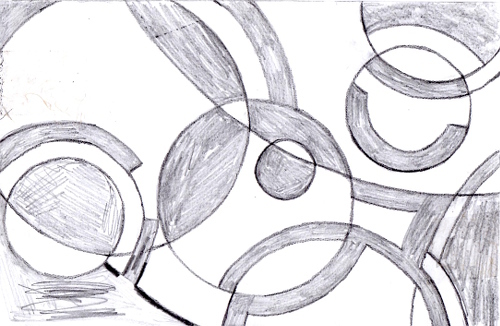 Print p4-72 from the same work session was influenced by my research on Paul Klee. There is a freedom and quirkiness in the line achieved that I like. 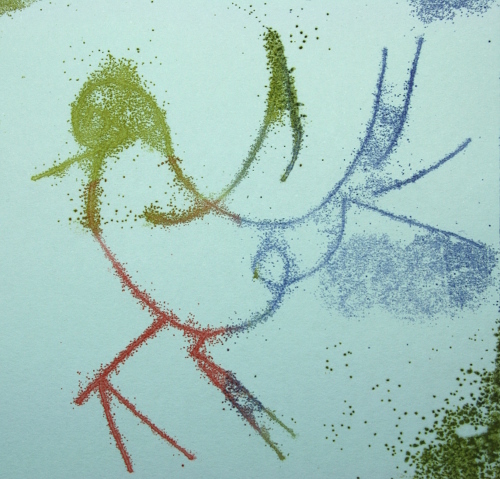 There is a range of markmaking with various devised tools that works well with the imagery shown. With the mix of colours it is altogether more light hearted than much of my work. Print p4-75 (also 22-Nov-2015) is the ghost of earlier jug prints. I’ve included it in Sorting because from a printmaking perspective it is poor, but for me as an image and idea starter it is rich. There are interesting lines and textures, a kind of vibration – it isn’t flat. It speaks to my interest in boundaries, in open possibilities and uncertainty. Print p4-76 (7-Dec-2015) was my first print created using a gelatin plate (thanks to fellow student Lottie for the suggestion). It’s an example of risk – these plates aren’t part of the course. It’s an example of failure – I pushed a step too far in an elaborate plan and “ruined” some very exciting stripes. 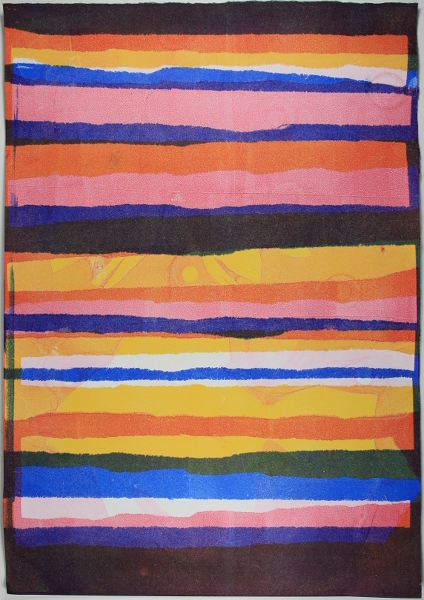 It’s an example of influence from research – I was thinking of stripes and textile development by Julie Paterson (missed in the blog writeup – see 13-Sep-2015). Plus nice use of masks and an interesting test of new-to-me products and colours. Print p4-77 from the same session is the ghost of the previous print and better shows the imagery I was working towards – although even this is simplified compared to the original plan. The design is based on the same jug as the earlier mask. Here it’s interpreted in fish stencils swimming in a stripy sea. More good techniques for developing ideas and quite an attractive result in itself. 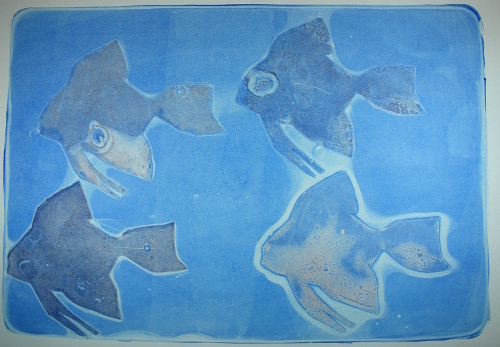 I’ve included two more prints from the gelatin plate fish sequence – prints p4-81 and p4-85 (7-Dec-2015). They show the wide range of results that can come from a single idea. In my earlier printmaking attempts I repeated slightly different things trying to make something work. By this stage I repeated to learn something new each time. Perhaps in future design development that will be one of printmaking’s strengths – after a little setup time, a fairly fast way of generating choices and variations. Print p4-89 (13-Dec-2015) uses my first collage block. Keen to bring forward materials from earlier in the course I risked thick, rigid materials such as computer components and plaster chips. This two colour version took hard work to print manually and is deeply embossed. The circuit card top right and insect screen bottom right are standout results with complex colour mixing. I think this is a good example of risk and reward when not following standard guidelines. I find print p4-97 (14-Dec-2015) thrilling. Part of another series of experiments, it uses composimold and polymorph samples from assignment 3 as stamps lifting colour from the gelatin plate. There is crisp, intricate detail, particularly from the composimold. There is so much potential in these new materials. I can take molds of anything that can stand a bit of heat and print in fine detail. A further experiment would be to mold a shaped surface and see if the mold could be flattened or cut open to use as a stamp. Could a plate be made from composimold then warmed and textured to create a semi-permanent plate? I tried something similar later with polymorph (27-Dec-2015) but didn’t have time to work through teething issues. Print p4-104 (14-Dec-2015) is unfinished business. I was testing a variety of stencil materials and a particular method of inking, pressing and removing to use multiple colours. As a result I see yupo paper and to a lesser extent wet media acetate as potentially very useful materials. The colour combination didn’t work, but I have ideas for my next attempt. Print p4-109 (17-Dec-2015) represents a pivotal point in the development of a printing process in which I see huge potential. It took a lot of effort to get a reasonable print on paper from my polyfilla collage block. 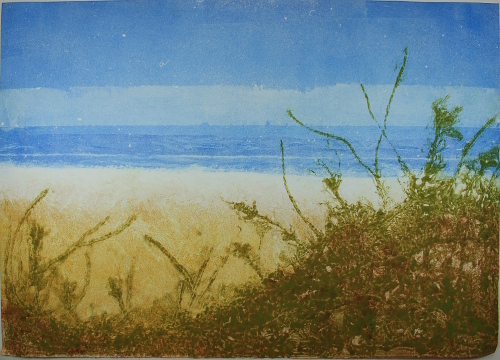 In p4-109 I rolled colour on the gelatin plate then pressed in and removed the polyfilla block. The print that resulted shows great texture. It’s not as crisp as the earlier example using composimold but in many situations that would be an advantge. Being able to print a plate direct or via the gelatin gives a lot of flexibility and more opportunity for developing variations. My first plate for project 2 exercise 3 didn’t really work as a design, but I’ve included print p4-126 (23-Dec-2015) as a later example of the developing print process. The gelatin plate was rolled with colour. The polyfilla plate was also rolled with colour then pressed into the gelatin, both adding and removing colour. There was some further manipulation then the print taken. It seems a logical extension that if I can print from flatish textured plaster then it’s worth trying shaped textured plaster. I chose cast plaster sample p3-48 as my three dimensional printing block. Print p4-128 (25-Dec-2015) was the better of two results. It could be very interesting to create a series of forms, some the original cast, some the printed shapes. I’d like to make a smoother cast and carve into it as a form of markmaking. Or perhaps in an grouping carve into the plaster which is now coloured to reveal the white underneath. An idea for the next assignment perhaps. 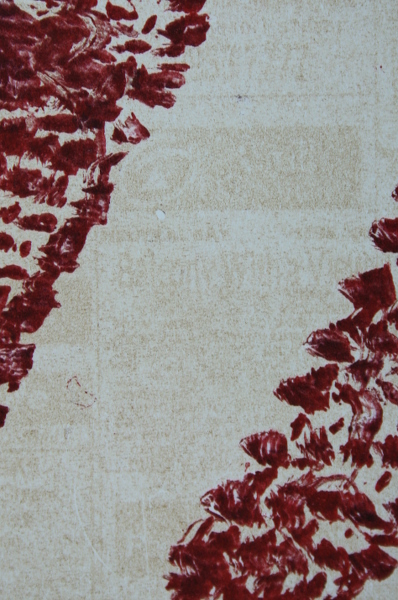 Print p4-137 (27-Dec-2015) is a chance by-product of yarn texture sampling for the next collage block. I haven’t examined quite what happened to get that effect, perhaps related to the strength of the ink and how the collage plate was pressed into the gelatin. It would be useful to be able to reproduce this, but experimentation is required. 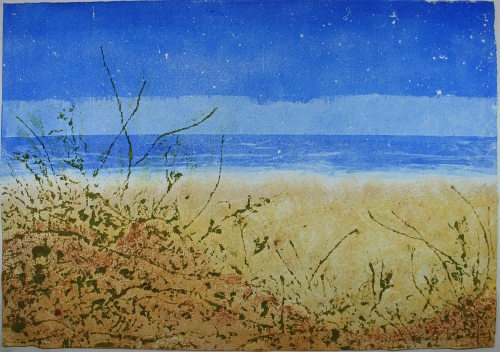 Prints p4-145 and p4-146 (27-Dec-2015) are two versions of a collagraph block inspired by a beach in Western Australia. They are a good example of the printing options developing. Both were printed in two layers, the first being colour rolled and textured on the gelatin plate. Both use the same collatype plate for the second layer. P4-145 was printed direct from the mountboard plate, with lots of hand burnishing. 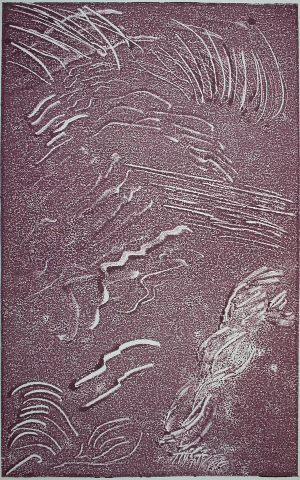 P4-146 was printed via the gelatin plate, with an excess of ink. Quite different results. Another interesting comparison is provided by p4-150 and p4-152 (30-Dec-2015). The collatype block used was mountboard with modelling paste used as both glue and support for a range of textiles, with acrylic matt medium used as sealant. The idea was that by embedding the texture sources rather than just gluing them on I could get more consistency in the height of the plate and thereby easier printing. P4-150 was printed on my little craft press and shows good texture from fine silk up to coarse hessian sacking. 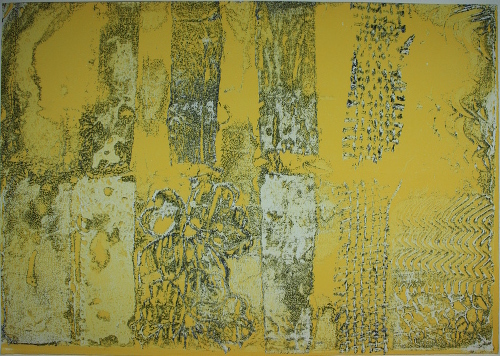 P4-152 was printed using the gelatin plate, rolled with yellow then pressed with the collatype plate which carried residual blue ink from another print. Very different results with different but interesting textures, using the same collatype plate. Prints p4-162 and p4-163 (31-Dec-2015) are in my opinion the best of a series inspired by banded ironstone formations. P4-162 was a complex affair involving the gelatin plate rolled with colour, textured with heat distorted plastic (from earlier assignments), colour partially lifted using newsprint, modelling paste collagraph plate separately inked, dabbing with two colours, then pressed into the gelatin, and finally a print taken. 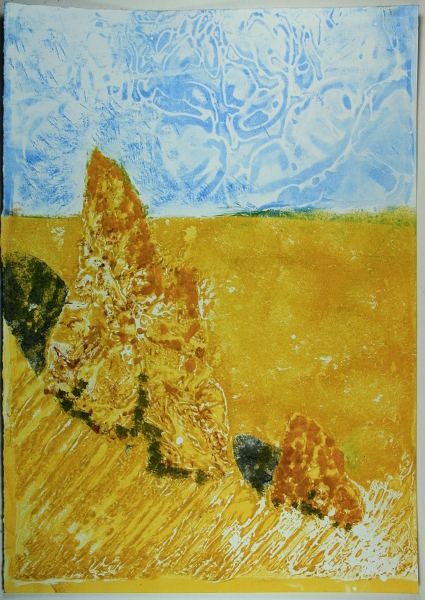 P4-163 was the result when I cleaned the collagraph plate by putting it through the ezicut press. I like them both. That feels like rather a large Sort, but I see them as presenting different areas of interest and it’s actually less than 20% of the prints produced. The last item I would like to include is attitudinal rather than a physical print. I found the earlier exercises very difficult. I examined some of the reasons for this in my reflection of tutor feedback on assignment 3 (8-Nov-2015). I was finding getting ink on the page very technical, I was stuck in the fundamentals, it was hard to let go of expectations of “good prints”, it was all so two dimensional. In assignment 3 my failures became glorious and there were exciting successes. Suddenly it was all failures. Challenging myself, I tried to keep focus on the purpose – printmaking as one stage of creation. I found positives in details, developed and followed up ideas, suspended disbelief. I tried to look at and understand the reasons underlying both negatives and positives, learn from them, and move on. Baldly – it worked. Over the weeks, as experience grew, work began to flow and I could be more responsive to what was happening in front of me. I have built up a foundation set of materials, processes and knowledge. The last couple of days while re-reading old posts I keep wanting to jump up and try one of the ideas that fell to the side. Why on earth did I never go back to put colour on the front of the stencil? The happy thing is there’s plenty of time, as printing becomes a standard part of my markmaking, recording and ideas development repertoire. Taking risks, responding to failure, feeling vulnerable – recurring themes, but I feel my resilience and eagerness continue to grow. creates amazing monoprints and collagraphs. Her miniprints particularly interest me because of the effective use of the small size ( 9 x 9 cm). Beachfront (link) and Moondreams (link) show how effective relatively limited colours and textures can be. A standout for me is Interlacing (link). Clearly a lacey knitted fabric and an open weave fabric were used. I wonder if the trees involved stripping back the top layer of board. Ross-Thompson uses glue on plates to create areas that won’t print. The colour is complex, some layered, some clear. I printed the image in its original size on glossy photo paper and continued to find it fascinating. Since first drafting this post a few weeks ago one of the edition of Interlacing has made its way from Scotland to Australia – a first for me, to act on my research. 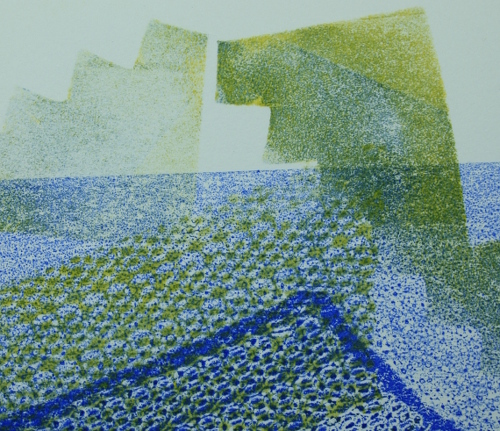 Also wonderful are Ross-Thompson’s explorations in colour in her Chroma and Chromascape monoprints. Red and green are seen in all their interatctions in Chroma 2 (link), while Chromascape 13 (link) is enlivened by textile use building energetic positive and negative space. 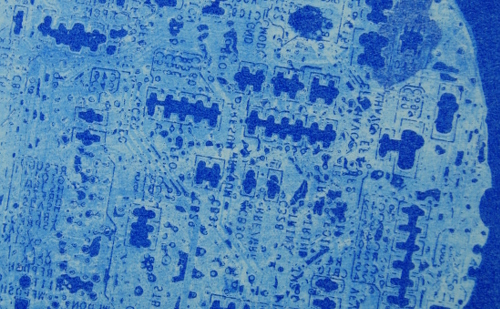 Textiles have been used in a number of Sarah Ross-Thompson’s prints. I’ve already mentioned Interlacing. In Beachfront the foreground fence looks like weaving, adjusted to give the right effect. Seeing these encouraged me to push further with textiles, experimenting in collatype plate 8 (30-Dec-2015) and in the banded ironstone formation prints (31-Dec-2015). I’ve just taken a quick photo of the two prints together and although they are completely different I can see the link. 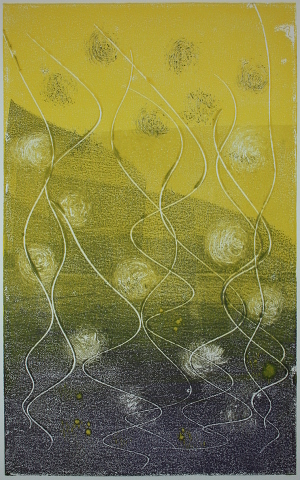 Bill Chambers has PDFs on a number of printmaking techniques on his website, http://www.billchambers.org/artists%20notes.html, including intaglio collagraph and monotypes. 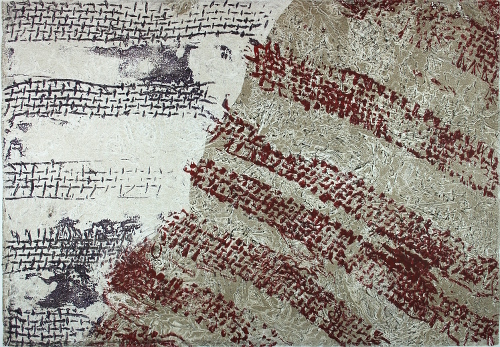 He describes his Clothing series (http://www.billchambers.org/image%20pages/clothing.html) as “cast collagraph”, and the imagery is highly relevant to a textiles focus. 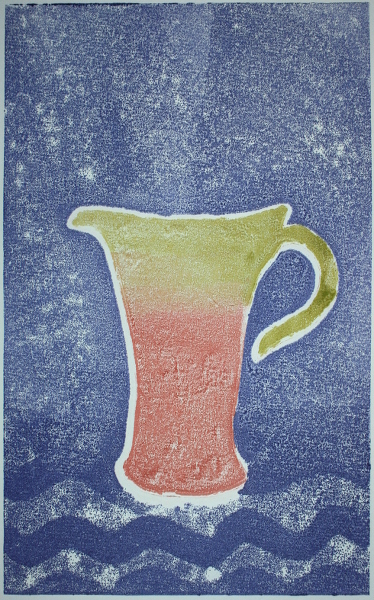 Most of his prints seem to combine different printing processes, so are less relevant to my current research. 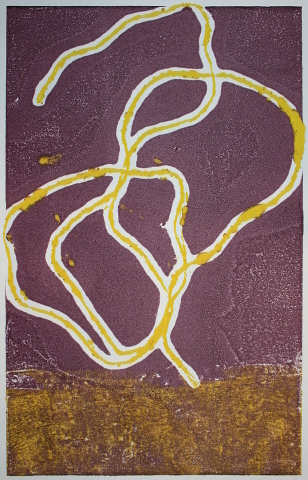 Tyrus Clutter has a video on creating a collatype print at https://www.youtube.com/watch?v=Z2VHD7R6rts, using layering of mountboard, carborundum and other techniques. I find his explanation of his problem-solving through a series of proofs particularly interesting. I’ve experienced some challenges with research during this part of the course. Previously I’ve recorded and responded to research work in my sketchbook. When I was looking at prints with the purpose of making prints I found it too direct, there felt no space for interpretation for my own purposes. I could look at a painting by Monet, find lines, and make something my own (print p4-37 3-Nov-2015). 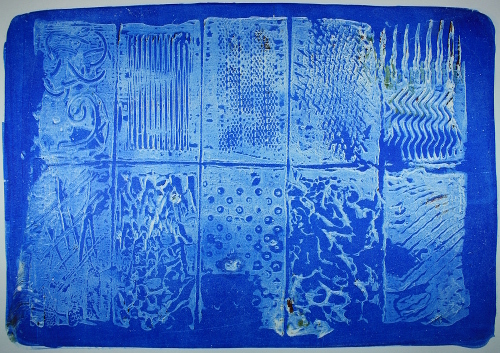 In terms of bringing printmaking research into my own work, the focus has been on materials and techniques rather than a visual response. Another challenge was simply the amount of interesting information available. Limiting the enormous field of printmaking to mono and collatypes still leaves an enormous and very active field. There is so much exciting work going on in printmaking, so many artists willing to share their images and techniques. In each research session I’ve found myself following trails and ideas, getting a broad rather than in-depth view. My material on any one artist has felt too insubstantial to post. Still, this is the end of the assignment and this blog is where I store and can later find information, so here are my scattergun notes. In black and white, use of rolling to add extra movement to the image. Nicola Jerome combining monotypes with animation to lovely effect. Susan Carney showing her process. Textured, apparently absorbent plate of sacking, cuts and inks stencils over the background which varies the texture and allows clearer imagery. I wonder if she reuses the plate, with traces of earlier colour on it. Reading about the unconventional, inventive, exploratory approach of Degas to materials and techniques included his use of counterproofs – putting pastel and charcoal drawings through the press onto dampened paper, in part as a means of checking and furthering a composition. ??? writes “variety of represented textures, without abandoning his principle of smooth, flat painting; and, something that was always important and that probably accounts for his predilection for pastels, monotypes, and wax sculpture, he could prolong indefinitely the process of revision, since each phase of the process was undertaken in a different medium.” (p. 150). This approach seems very relevant to my current mixed media for textiles course, including the idea of ongoing revision, of developing an idea by approaching it through different media. Also in this paper is an interesting section on the variety of tools and combination of techniques used by Degas in his monotypes (p. 155). Teaches a “stacked” monotype method (account of a class taught by one of her students http://sticksstonesnpaperstew.com/2013/05/09/starting-the-monotype-process/.) Interesting for registration method for plate. 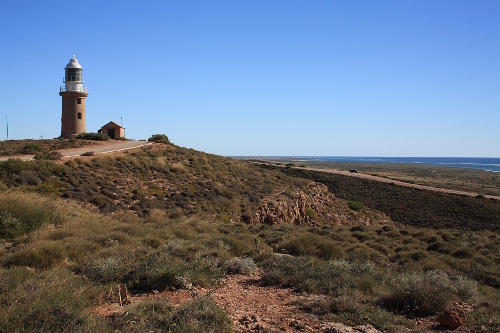 Excited that his work includes Australian landscapes, although some that particularly resonate with me (salt pans near Hyden, which I visited a few years ago and is amazing country) are painted rather than monotypes . https://vimeo.com/41523428. A flowing approach developing ideas. 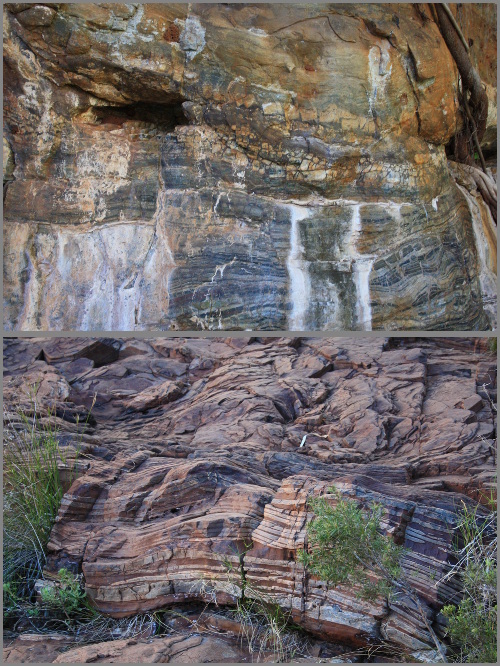 In an earlier post (30-Dec-2015) I selected Banded Ironstone Formations seen in Karijini National Park as the inspiration for my last collatype block. The experiments recorded in that post gave me confidence in a new method of preparing the plate and provided a library of textures with which to work. A quick sketch of the design followed. I wanted something graphic, not at all realistic. I was zooming in and exploring large scale stripes (I think the colour mixing stripes of p4-76 is one of my more successful prints – 7-Dec-2015). 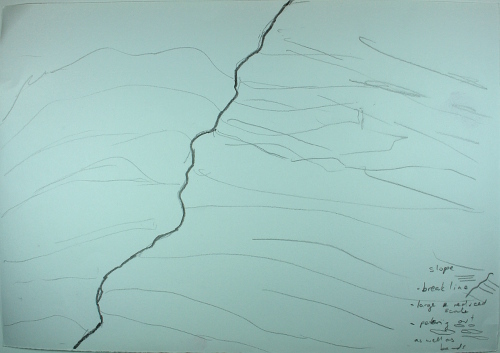 The focus was a fracture line in the formation, the closer bands thrust up at an angle, more distant stone lying horizontal. I would emphasize the two sections by using different scales of texture. I also wanted to break a line with small inclusions, a small detail of interest seen in one of my photographs. Referring back to the texture prints, I chose coarse hessian and a mid-weight cotton for the foreground textures – the two fabrics at the left of the top row in p4-150. For the background I chose the lighter hessian and tissue silk, the fabrics at each end of the bottom row. Just as in the earlier sample the plate used mountboard as a base, modelling paste as glue and support for the fabrics, and acrylic matt medium as sealant. The only modification was pressing the completed, dried plate under some heavy books to remove any bowing, suspecting that this was the cause of some issues in the previous prints. I was already inking the plate in a mix of violet and red akua intaglio inks when I remembered to take a photograph. A single mixed colour of ink was rolled over the surface. The print was taken on cartridge paper using my small ezicut craft press. The layers of wool batting I use as a printing blanket went through the press at a slight angle, leaving one edge light. Otherwise the image is full of texture and detail. The four textiles create four different textures. 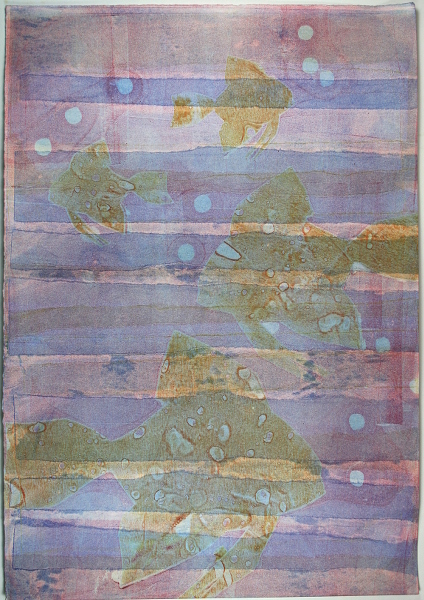 My small hessian inclusions can be seen in the first cotton stripe in the top left corner of the print. Although full of incident the image is not interesting. The design is not a simple repetition, but the break and the intended foreground and background are not clear. In one of my experiments, p4-152, there was sufficient ink left after printing direct from the mountboard to transfer colour to the gelatin plate. I rolled the gelatin with burnt umber liquid pigment and pressed in the collatype plate without re-inking it. The print was taken on cartridge paper using hand pressure. The print is bland, featureless, uninteresting. 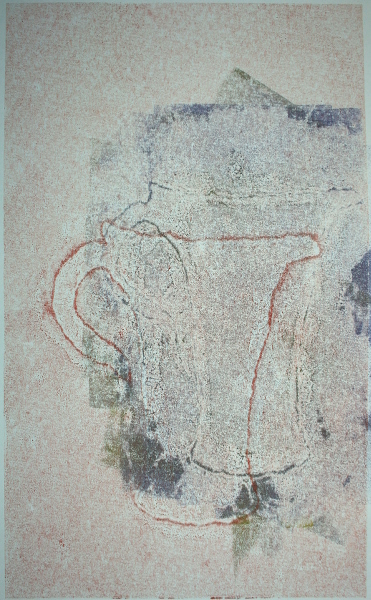 The earlier experiment used a plate previously printed using a brayer. It seemed the little press had been much more effective, leaving little for the next print. Too little burnt umber had been rolled on the gelatin, compounding problems. I rolled the same mix of intaglio ink on the mountboard plate and took a print on copy paper using the baren. 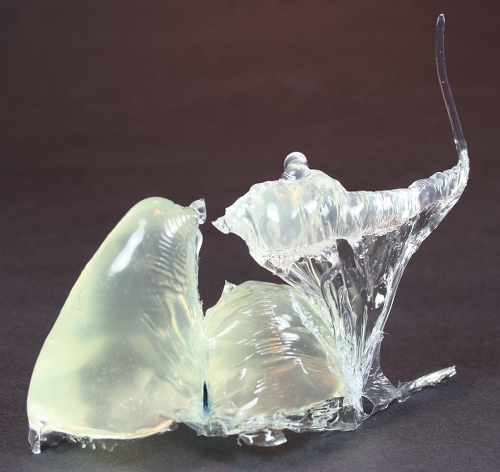 So little transferred that I have not included that print in my results. Instead I moved straight on to the gelatin plate, rolling it with a larger than usual amount of lamp black liquid pigment. The mountboard was pressed in, then the print taken on cartridge paper using hand pressure. There is good transfer of hessian texture in some areas. There is insufficient contrast of the two ink colours, leading to a dull image. 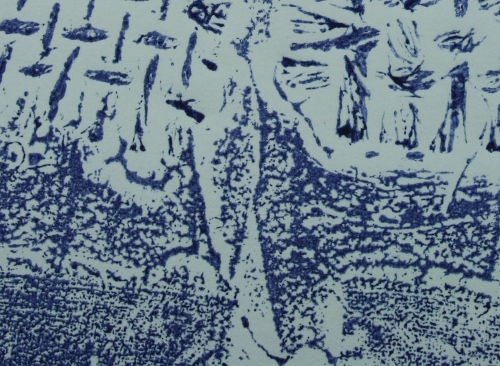 It can’t be seen in my photographs, but another innovation was introduced in this print. In this exercise we are asked to work between A4 and A3 size. My little press is just wide enough for A4. The gelatin plate fits A4 with a small margin around. Balancing requirements and resources, almost all my collatype prints have been an A4 page printed edge to edge, without the uninked area normally used. On the press the only alternative would be to go smaller. On the gelatin plate I didn’t want an unsightly, uneven border of untextured colour and I couldn’t think of a manageable way to mask the edges. The answer turned out to be simple. In this print I inked the full gelatin plate as normal. While the mountboard plate was still in place I gentle pressed strips of paper into the gelatin following each edge. When the mountboard was removed the strips stayed in place, providing a mask and crisp uninked edges with an A4 image on A3 paper. This first attempt wasn’t centered well, but I have used the technique on all subsequent gelatin prints and my placement has improved. The new borders enhance the print, but seem a waste of pixels on screen so are cropped out of the photographs. I needed more contrast between ink colours so texture could be seen. I also wanted to differentiate foreground and background stone. Rather than using a mixed colour of intaglio ink, I dabbed the foreground area of the mountboard with red and the background with violet. Rather than taking an initial print the plate was blotted on scrap paper with hand pressure. When rolling burnt umber liquid pigment on the gelatin plate I realised I had used too much. I used a page of newspaper very gently pressed on the plate to lift some colour. I quickly re-rolled to remove traces of the newspaper, pressed in the mountboard plate, then took the print on (A3) cartridge paper. The different colours can be seen clearly. The hessian texture shows quite well and there is beginning to be some impact from the other fabrics. However in most areas the hessian strips seem to float above a single, plain background. It’s rather dull. In the previous print the use of newspaper had left traces of the original classified advertisements on the plate. I rolled these out before thinking. Could I get the effect deliberately? I used the same inking and blotting method on the mountboard as in the previous print. I put more liquid pigment than needed on the gelatin, blotted lightly with newspaper, and without re-rolling completed the print onto cartridge paper. In the detailed photograph you may just be able to see that real estate including a balcony with view was being advertised. Because the newspaper was pressed into the gelatin then the print taken from that, the lettering shows normally, not reversed. This could be very useful at some future time. Unfortunately in this image the burnt umber areas remain boring. A lot of colour is now coming from the hessian. Ink appeared to have built up on the plate. Given the amount of ink still visible on the mountboard plate I did not re-ink it. Although the newspaper texture in the previous print wasn’t sufficient, perhaps I could use something else to create texture. I rolled a lot of lamp black liquid pigment onto the gelatin plate, then pressed in a piece of heat treated thin plastic (previously seen wrapping a jug in sample p2-66 (22-Jul-2015)). The rest of the process was as in previous prints. There wasn’t enough ink on the mountboard plate, or at least it was all in deeper spots and not transferred to the gelatin. The lamp black was too dark, even after blotting/texturing with the plastic. However I do have the texture I wanted! The image is lost, but I think this could be a very useful effect. I redabbed the mountboard with red and violet, then blotted it on scrap paper. The gelatin plate was rolled with burnt umber. I used the same piece of plastic, unwiped so still with traces of lamp black on it, to create texture. I cut a piece of newsprint (blank) in the shape of the background rock area and used it to lift some of the colour from the gelatin plate. The mountboard plate was pressed in and the print taken from the gelatin as before. Foreground and background are differentiated. The stone is textured and the mix of lamp black with the burnt umber is very effective. It’s not a great design but it’s finally making sense. The change of slope of the lines is clarified. In the foreground stone in particular the bands of colour sit together as a single stone. The background hessian still floats a little, particularly in the central bands. The coarser hessian has too much ink and detail is lost. However overall I am pleased with this result. I tried to scrub excess ink out of the hessian using paper towels. This was not effective. 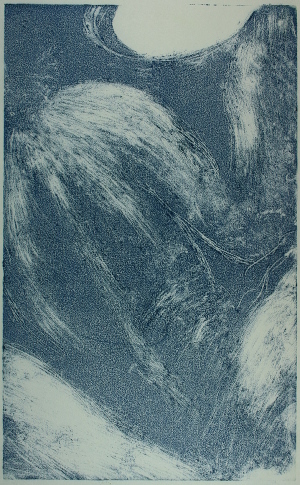 Then I thought to make a print using the ezicut press, which forces the paper deeper into the texture of the plate. Copy paper was used for the print. This happenstance cleaning print is the closest to my original ideas. All fabric textures contribute. Foreground and background are clearly differentiated, although the depth effect is not strong. The bands of each stone area sit together in a single mass. There’s a thinner band of cotton in the middle of the foreground red area. I think more variation in stripe width would improve the design. I decided to make one more print, using everything learnt so far. The cleaned mountboard was redabbed with red and violet. This time red oxide liquid pigment was used on the gelatin plate. The heat distorted plastic, still with traces of lamp black and burnt umber, was pressed on lightly with a baren to create texture on the gelatin. The newsprint shape was used to lift colour in the background. The mountboard was pressed in, then the print taken on A3 cartridge paper. The background texture is complex. The image doesn’t quite work, although I find it hard to define why. The slope of the break between foreground and background is wrong. I think the shape created lifting colour with newsprint has not been registered with the shapes on the mountboard plate, so that very important break edge is muddled. Given the previous success of p4-163, I decided to finish the session and clean the plate by printing on the ezicut press with no additional ink. Cartridge paper was used. 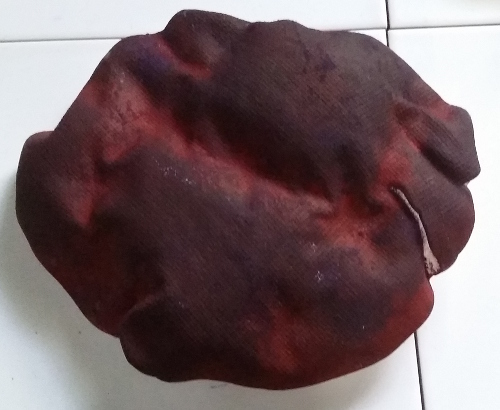 The result in the red area is very dark and much of the detail of the cotton fabric has been lost. The result is striking, but I find it clumsy and messy. Given the amount of colour on the previous print I took another using the ezicut press, this time on copy paper. The result is lighter and a lot of detail can be seen – including the little insertions of hessian into one of the cotton bands. I think this is one of the better prints of the series. This was the final print session for this Part of the course and I found it very satisfying. 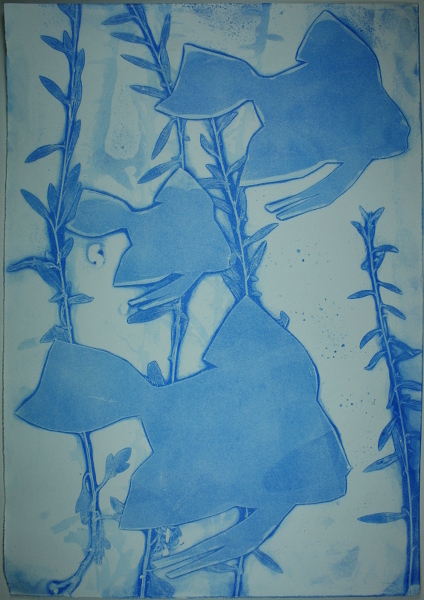 I brought forward ideas from previous experiments in both collatypes and monotypes. I was able to improvise and adjust methods and materials in response to my results. There are definitely ideas and techniques I want to take forward. Earlier this week I spent a day with friend and fellow OCA student Claire (tactualtextiles.wordpress.com/). We started together on the textiles pathway, and Claire has since transferred to creative arts so she can combine textiles with her new-found passion for printmaking. Claire is currently working on the final project for Printmaking 1 and has participated in workshops and master classes here in Sydney. I asked to visit to see her in action – all those finer details of working, her setup and tool choice. She responded by giving me a full, personalised, one day workshop in her studio. It came with homework. At our last get-together, visiting the S.H. Ervin gallery for the Destination Sydney exhibition of works by Cressida Campbell, Grace Cossington Smith and Margaret Preston, Claire gave me pieces of lino and pvc foam sheet, each 12 x 18.5 cm. Decide which areas would be cut away and which would print. In doing this, consider the overlap with layer 1. Don’t obscure areas of particular interest. I arrived for the day with designs drawn, paper pre-cut and plate surfaces scrubbed. While I was put to work transferring the designs and cutting the plate, Claire made a “simple jig” (her words) precision measured to my plates and paper, to aid registration. Thoughtfully designated work areas. I think the inking area stays constant – tools and inks in place, glass plates (non-skid mat beneath) with regions for rolling main and other inks and for the plate being inked. Drawers below hold less frequently used tools. Turn to the right and there is the printing area – a space to store the blankets etc, right next to a place to build the sandwich of plate, paper, blankets…, right next to her large book press. Additional benches around the room are set up as required. One table was the cutting area. Another was paper preparation. Cleanliness. For example the plate to be inked is on a sheet of newspaper. The glass top remains clean and the plate is easy to rotate for rolling from all directions. A revelation! I knew Claire doesn’t wear gloves while working which amazed me as she is so fastidious. The way she works they just aren’t necessary – a slightly oily rag (kept in its own special container) and her work shirt deal with any small smudges. When printing my sampler plate 8 yesterday (30-Dec-2015) I tidied up and made just a little more space for myself, and had the plate on a piece of newspaper for rolling. Such a small thing, such a big difference. Easier, better work and easier cleanup. Claire’s printing shows the same care and precision. We did two test prints of the lino on newsprint. They look very similar in the photo, but it allowed us to build up an even base of ink and to fine-tune some of the carving. For the bottom layers I chose colours for particular areas. We decided to use primary colours, to see what mixes would be produce. We rolled, checked coverage, then colour was removed using paper towels and cotton buds. I had great difficulty – finger prints and stray edges of towel kept marring my almost ready plates. The photograph shows the initial inking for layer 1 of print 1. 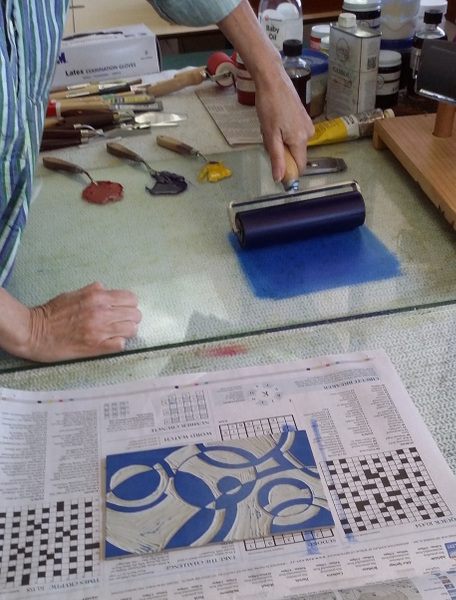 The lino block was already inked and put safely to one side. Print 1 layer 1 printed. Claire is holding the paper up and still in place in the registration jig. My job was to clean the foamex plate and then apply yellow ink over the full plate. 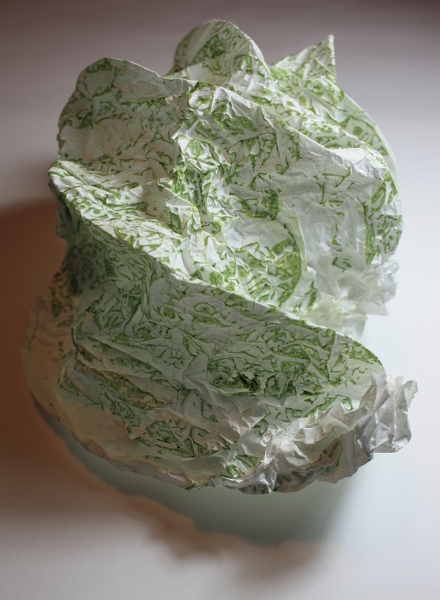 The paper is mingeshi – quite light and a buff colour. I notice we printed on the smooth side. I should be more conscious of this in my own printing. Printing from foamex plate complete. Clearly my plate cleaning wasn’t entirely effective. The initial pink/red has all been covered to produce an orange. Claire’s press screws down onto the plate (can’t believe I didn’t take a photo). You can see above how complete the ink transfer was. The completed print. The colours are subdued due to the colour and weight of the paper. I’d also chosen a yellow paint with less pigment than Claire’s other printing inks. For later prints we mixed this with a brighter, more heavily pigmented yellow. All the red has mixed to orange and there is very little clear blue as the first layers almost completely covered the image. The areas where I’d scratched into the foamex work well. I like the interference patterns where the lino carving was a bit shallow, but there is a bit too much of it. We carved away some of the higher areas and cleaned those parts of the plate after inking in later prints. There’s a lot happening in the design but I think it holds together well and creates a lively, engaging image. For print 2 the basic sequence of printing was the same. The red regions are slightly different. The yellow was adjusted. We also cleaned part of the yellow plate so some red remained uncovered. The print is on white cartridge paper. Together with the stronger yellow and some clear red this makes a much brighter print. The detail photo shows the different colours achieved in our layering of the primaries. I particularly like the yellow on orange herringbone. I didn’t do a lot of extra scratching in the plate, but it really brings in some extra energy. For our final print we changed things around a little. 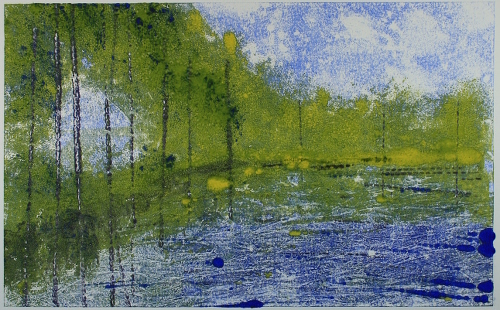 Blue and yellow were used on the foamex plate and red reserved for the top lino layer. We also did some fading and manipulation of colours on the foamex, not keeping strictly to the individual boundaries. We used cartridge paper. I really like the print at this point and almost wanted to stop there. Strong colours and you can appreciate the strength of the lines and the little fussy details. Still, there was more to see and learn. New areas of the combined designs have been revealed in this print. I think overall it is less balanced and well-integrated than print 2. It’s certainly darker with more of the brown of the three colours mixing. I really like the area centre top, with a line of herringbone, the lozenge marks above and the red sweeping in. Altogether a wonderful day full of fun and learning. As well as working hard on the printing we talked about our studies with a wider perspective. You can read Claire’s account of the day here. Distance learning is difficult and I’m enormously lucky to be sharing the journey with Claire. I just wish we lived on the same side of the city. The drive can be 1.5 hours or more each way depending on traffic, and that’s a big chunk out of talking time. The patchiness of printing with collaged elements bothered me. Even quite low elements like the yarns built up when overlaid to create areas that either didn’t print or captured blotches of ink, ready to release at awkward moments. Thinner or dampened papers that shape better around the collage elements could be worth pursuing. A few of my earlier prints used those, with limited success. Lower relief or larger shapes with few if any little crevices to block or slurp up ink could be the answer. 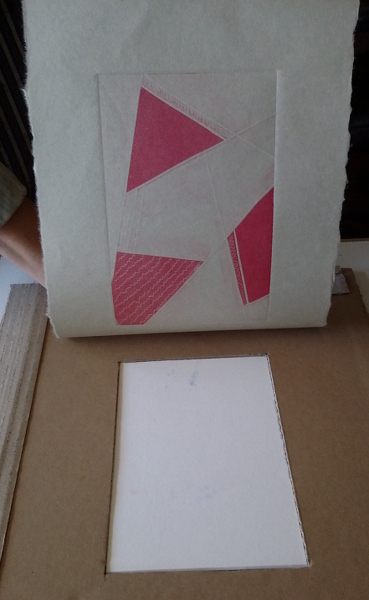 I thought of Sarah Ross-Thompson’s minimalist block, peeling and tearing into mountboard, using glue and masking tape, with none of her normal textures – see her step-by-step explanation of her process at https://www.facebook.com/rossthompsonprints/posts/1069627893068427. 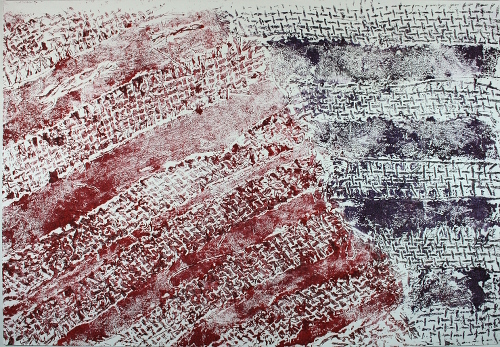 Lynn Bailey demonstrates collagraph building using simple cut paper, card and wallpaper – see https://vimeo.com/50941703. I played with a photograph of Vlaming Head lighthouse in Western Australia. Already a simple scene, it could be further abstracted into some basic shapes. The idea didn’t excite me. 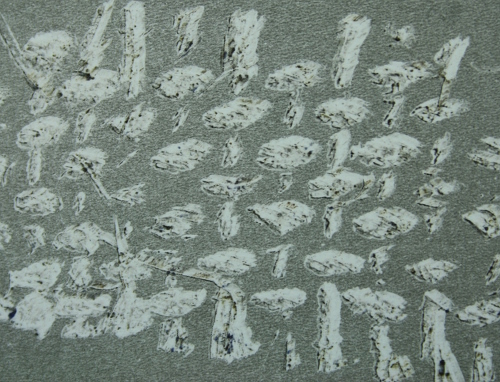 My second collatype plate used scratching and tearing into mountboard with a variety of sealants, and the resulting prints such as p4-91 were under-whelming (13-Dec-2015). The artists I’ve mentioned above have developed tool-sets – shellac for sealant, a specific cheap house paint for encasing texture bits, particular tapes that catch more or less ink, substantial presses for intaglio printing… It was similar in the workshop I did with Jet James (16-Jul-2015) – he used a wide range of tapes, nail polishes, things from the hardware store, bits and pieces and overall knowledge built up over time. The lighthouse design felt too similar to my recent attempts. I didn’t have immediate ideas for improving my disappointing results with torn and scratched mountboard. I looked for a different, simpler idea. In the course notes there are photographs of student work, including one of not-quite horizontal bands, a few textures, it seems a single, dark colour. In fact it could even be the plate rather than a print – some coarse fabric shows colour that is not the background paper nor the ink colour. Either way, it is striking and effective. I chose a new image source – photographs of the banded ironstone formations around Fortescue Falls, in the Dales Gorge of Karijini National Park. A detail could provide the varied, textured bands I wanted. I still needed a better way of creating the collage block. In the past I’ve experimented with layering tissue in modpodge, producing various levels of surface texture (original information – aztec turquoise mask research page 6-Dec-2014; bracken sketchbook 2-Jan-2015). I used off-cuts for some quick print tests. Working with each sample individually, I rolled using akua intaglio ink and printed onto cartridge paper. 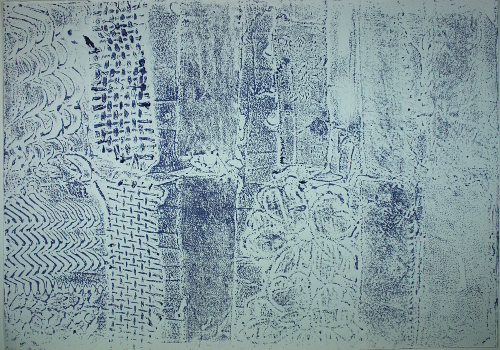 The empty space in the right of the print was the first attempt – the highly textured, printed using a baren. No use at all. 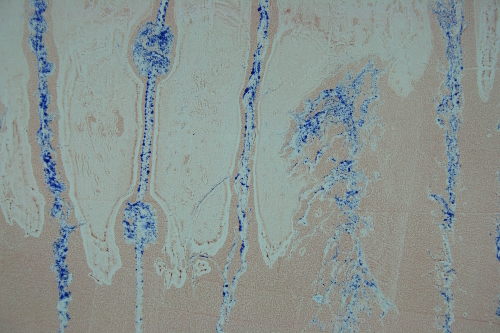 Second right was the same highly textured tissue piece, dabbed with ink and printed using a brayer rolled heavily. Some areas printed quite well, with a crystalline appearance. 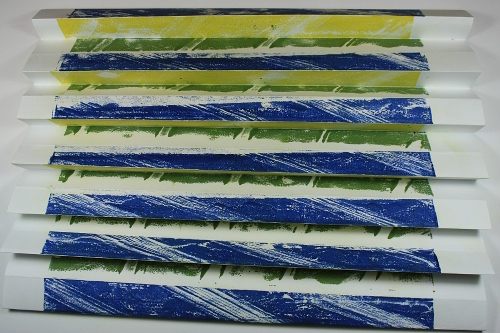 Second from the left was the lightly textured bracken piece, printed by rolling with a brayer. The section on the left was the least textured tissue piece, from the aztec mask work. 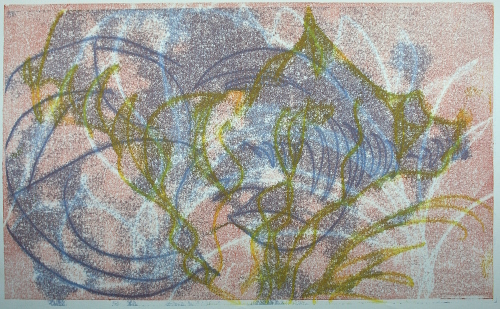 It was printed using the brayer. The highly textured tissue didn’t print well, but both the others are encouraging as a printing source although not as suggesting stone texture. 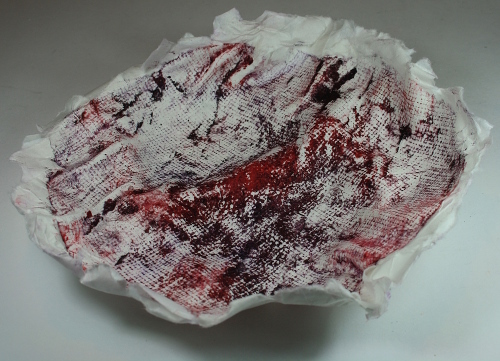 I rolled the gelatin plate with quinacridrone red and pressed in the roughly wiped tissue texture samples. The plate was printed onto copy paper using hand pressure. Overall the print was very light. I clearly did not roll the colour well. 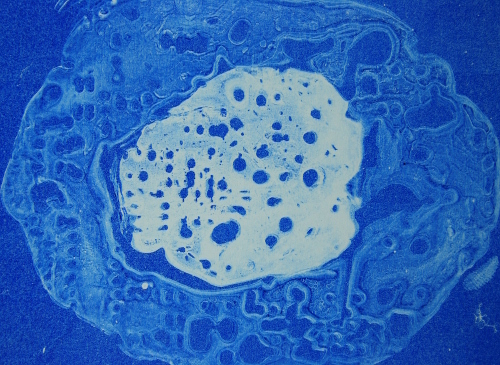 However there is some interesting texture, particularly where colour from the earlier printing has transferred. I inked the gelatin with a bit more care, this time using lamp black. I placed the tissue samples on the plate and covered them with newsprint before pressing gently. Newsprint and samples were then removed. All three samples produced interesting textures. With the colour chosen they look more stone-like. These experiments show I can get interesting areas of collage printed texture with my current equipment and materials. I took from this that low relief without great variation in surface level between elements is key. Larger areas at the same general height also seems to improve results. I wanted to step back from a very literal representation of the rock layers. I wanted to use textiles in my printing. Instead of simply gluing pieces onto mountboard, could I slightly embed them in something like structure gel to get more consistent height and lower relief? An A4 piece of mountboard was used as the base. I spread it evenly with modelling paste, described on the container as “a fine texture paste with soft yet thick sculptural consistency”. I hoped that it would act as both glue and support for my textures. Top row, left to right: Silk organza (10mm? ); tussah silk; brocade; mid-weight plain weave cotton; coarse hessian, from a coffee sack. Bottom row: Tissue silk; habotai silk (8 mm? ); synthetic organza stitched lace; light plain-weave cotton; hessian. On the right is plain modelling paste textured with a range of tools. When the paste was dry I coated the plate with one layer of acrylic matt medium. In the collatype plate 2 experiment this gave the deepest tones in printing. The prints below all show the top row consistently. However left and right vary depending on the print process. 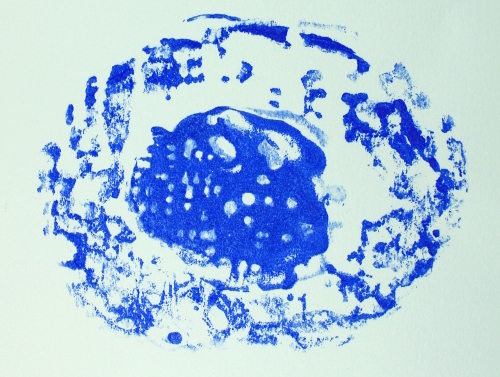 The plate was rolled with a mix of akua intaglio inks. 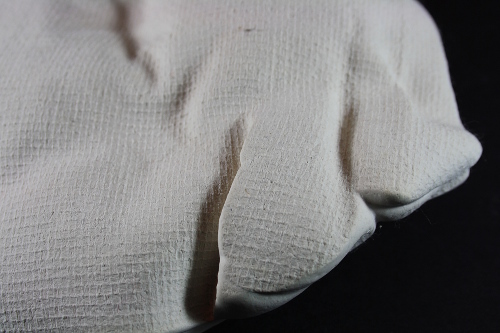 I wiped a couple of spots between the brocade and the tussah silk, to see if the paste plus medium surface could be altered effectively by such techniques. The print was taken on cartridge paper using the ezicut press. In the close detail above I can see the weave structure and the ravelled edges of both the hessians and the cottons below. I find this print very exciting. Every sample has given a different texture. I can see the pattern of the brocade, the zigzag stitching on the synthetic organza. It was easy and straightforward to print. The very coarse and thick hessian was included as a low probability, push the boundaries piece. To my surprise it printed beautifully. 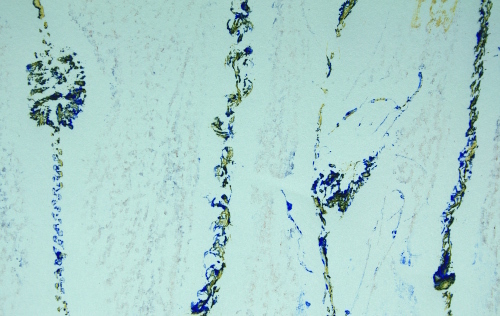 The plate was rolled with a mix of akua intaglio inks. 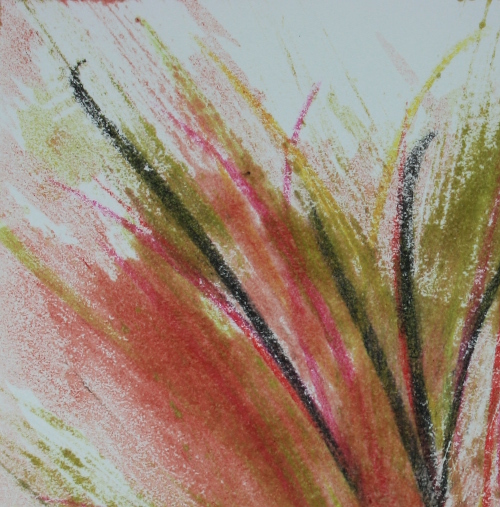 I printed onto cartridge paper using a brayer with considerable energy and force. Generally only the top surface level has printed. In most areas this has led to less definition and less information. The organza flowers in the bottom row are clearer in this print, with the stitch lines showing the shaping of the blossoms. Which version I prefer would depend on my purpose at the time. Diarylide yellow liquid pigment was rolled on the gelatin plate. The uncleaned mountboard plate was pressed in firmly. The gelatin was printed onto cartridge paper by hand. I haven’t liked this colour combination in the past, but chose it for easier judgment on the contribution of the different plates. The colour proportions and distribution are quite different compared to p4-139 (27-Dec-2015), in which I found the mix unpleasant. In the current sample I find the patterning intriguing, and I think the colours assist this. There is lots of interest, lots of potential, in this result. There appeared to be a lot of ink on the mountboard plate, so I took a print on rice paper, pressing with baren and hand. The result is soft, ethereal, but still with a lot of detail in most areas. I find the flowers particularly interesting. The fabric came from my mother’s wedding dress. Perhaps I will tell a story using this effect one day. A mix of red oxide and burnt umber liquid pigment, together with the yellow still on the roller, were rolled onto the gelatin plage. The previous print had a number of areas of poor contact, particularly at the ends, so this time I pressed the mountboard into the gelatin very firmly. The print was taken on cartridge paper using a baren. This time too much colour was removed, and there was less blue on the mountboard to transfer. The print is very soft and indistinct. It reminds me of old frescoes in photographs of Pompeii. I think the soft, unobtrusive but varied effect could be very useful as a background, or for subdued interest in a non-focal part of a work. For this print I rolled the gelatin with lamp black liquid pigment, and tried to press the mountboard in with a moderate level of firmness. The print was taken on cartridge paper using hand pressure. My pressure was still not right, not even across the plate. It might be easier using another stiff board between. The coarse hessian and the flowered organza are two stand-out results. At this stage I felt I had enough information available to guide my choices for the banded ironstone formation collage plate. I wanted to use the same general method to create the plate. However I don’t have the results to show yet. I wanted to stop and record results so far, really examine the prints already produced, before committing.